The holidays are approaching and times are getting busier by the day. So how do you plan to keep your workout schedule on track through the holidays, instead of pushing your fitness goals off to the start of the New Year? With the holidays around the corner, we inevitably become busy with shopping, traveling, holiday parties and big celebrations - which usually involve eating, drinking and more eating. Unfortunately, two important commitments that oftentimes get compromised are eating healthy and working out. So how do we combat the average weight gain of 7 to 10 lbs during this time? Here are some key tips that could make your holiday time successful. First, commit to make your workout a priority. When we get busy, we push working out off to the side, we feel we just don’t have the time because we have so many other things that NEED to get done. What we need to do is act like it is an appointment or make it an appointment. For example, meet up with a friend at the gym to work out or find your favorite group fitness teacher class and put it on your calendar. Furthermore, if you know your schedule is compressed that day, make your workout the first event you accomplish. We all have been in the situation where we will work out later, but we never do. In short, make it a priority that day. Secondly, make your workout quick and effective. You might not have the time to spend an hour at the gym, so make it 30 minutes and make it count! If you are going to do 30 minutes on the treadmill, do intervals of increasing and decreasing speed. Also, you could pick 4 exercises and do each one 12 times for 3 rounds with little to no rest. “Time” alone does not make the workout; efficient use of your time makes your workout. So, over the holidays, resist the urge to bring your cell phone in to the gym “in case someone texts you” or to read the news between exercises. Your task is to get an efficient workout for the limited time you have, so commit to this. Thirdly, watch what you eat and drink. You want to enjoy the holidays and with that enjoyment comes food and drinks. Don’t deprive yourself, but be responsible and partake in moderation with food and drink. Watch your alcohol intake, these are usually empty calories and are not worth the extra pounds it could create. Also, try to drink more water before dinner and during dinner so you won't be tempted to over-eat during the meal. Finally, try to walk. You might miss a day or two of working out and that is okay. 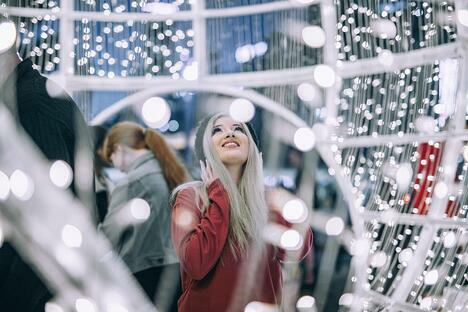 If you can’t make it to the gym, walk around a shopping mall or take a stroll downtown to see the holiday light displays – do something that requires walking, even while you enjoy spending time with the people you love. Ultimately, the holidays can be a challenging time to maintain healthy habits, even for the most committed among us. That being said, by following some simple steps you too can maintain your healthy ways and not need to make working out a New Year’s resolution… again! Good luck!